Taylor Swift seems to have made an addition to her already impressive music career. The Look What You Made Me Do artist has been the proud owner of 8 houses including a $20 million penthouse which she purchased back in 2014 and sold in 2017. The grandest of the houses Taylor Swift owns is her Greek revival estate in Nashville, which is incidentally her home-town. This seems to be her most favorite, and she tries to spend most of her time there, being that it is located in the place she grew up. She sure does remember her roots. This, though, is her second Nashville home, the first one having been turned into a historical landmark, of course with her permission and will. The third of the eight is her Watch Hill Seaside Estate which spreads across a 12, 000 Sq. Feet land and which is the highest point in Rhode Island town. The house has seven bedrooms, a private pool and a view you would kill for. 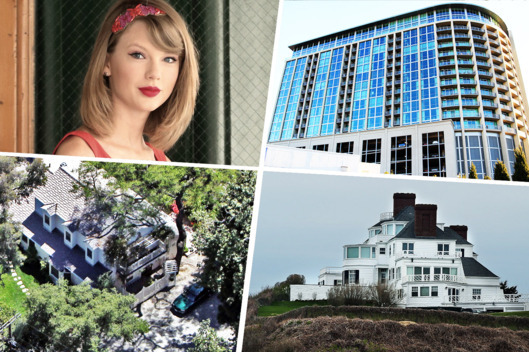 Taylor Swift finds this to be among her most impressive houses, as it is a perfect fit for hosting most of her widely known notorious parties. In 2014, the A-list artist bought two adjacent penthouses in Tribeca which she later turned into one big duplex. She put both of these on the market in 2017. However, when they were still in her ownership, the duplex had ten bedrooms, ten bathrooms, an incredibly designed staircase, and a billiards room. But guess who owned the house before she did? The one and only Peter Jackson, the director of Lord of the Rings. Just three years after she purchased the penthouses, Taylor Swift bought the next door century-old townhouse. The fully furnished house was worth $12.5 million, and she later expanded horizontally, making the two penthouses and this townhouse one. This 1912 brick townhouse is among her most beautiful houses, especially because of the old charms which have been enhanced with the modern renovations. It is complete with five bedrooms, seven bathrooms, and an extravagant and massive indoor pool. It also has a jacuzzi and a built-in barbecue. Taylor Swift purchased this “whimsically girlie” house in her twenties, making it her introduction purchase into the real estate business. This is among the three properties she has owned in Nashville, and it just shows how much she wants to stick to her roots. The modern penthouse has an open layout and massive glass windows.